MAST is pleased to present "An Ultraviolet Atlas of Nearby Galaxies" based on images obtained with NASA's satellite, the Galaxy Evolution Explorer (GALEX). The Atlas was prepared by A. Gil de Paz,S. Boissier, B.F. Madore, M. Seibert and associated members of the GALEX Team. The full paper is posted on astroph/0606440 and has been published in ApJS 173:185. 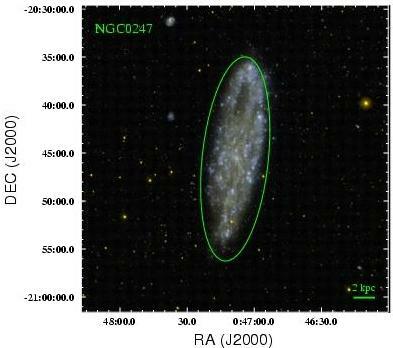 The team presents images, integrated photometry, surface-brightness and color profiles for a total of 1034 nearby galaxies recently observed by the GALEX satellite in its far-ultraviolet (FUV; 1516A) and near-ultraviolet (NUV; 2267A) bands. For information about the sample, data reduction and intensity maps, please see the README file that accompanies these data. The Search Interface uses the standard MAST search tools to allow you to search for data of interest. You may download data for selected objects. Click on the target name to bring up a page with information about the target and observation. The page contains data from the tables in the paper.